Over the past week the ADI Spirit of Freedom team has experienced the heartache and joy of a difficult enforcement operation. Having identified an illegal circus with a lioness in the far north of Peru, ADI put it under surveillance, with a raid scheduled for Friday. On Wednesday however the circus suddenly packed up and made a run for it. ADI went in pursuit but the circus was lost as it crossed the border into Ecuador, an illegal act as Ecuador has a ban. An ADI team searched the region around the border throughout Thursday and met with officials and police in both countries to be on the lookout for the circus. Reported sightings on Friday were investigated but proved fruitless. The gloom was lifted after another raid organised for Friday proceeded. An illegally trafficked spider monkey called Pepe Lucho and an as yet unnamed macaw were confiscated from a restaurant where they were being exhibited. Arriving at the Spirit of Freedom rescue centre late on Saturday night, both are doing well and Pepe Lucho will be heading back to the Amazon with ADI. 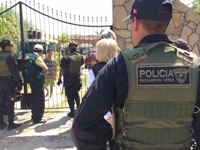 We cannot praise enough the government officials of SERFOR Piura and the Piura police who undertook the raids with ADI. We have previously undertaken three successful circus raids with SERFOR Piura and will also be working with them on an awareness campaign about illegally trafficked animals. ADI will remain vigilant for the circus and any others.